There is currently just the 1 ferry route running between La Palma and La Gomera operated by 2 ferry companies – Fred Olsen Express & Naviera Armas. The Santa Cruz de La Palma to San Sebastian de la Gomera ferry crossing operates weekly with a scheduled sailing duration from about 2 hours. Whilst we’ve taken great care to ensure the information on this page is correct, as the frequency and duration of crossings on all routes can vary from time to time we’d advise that you get a live quote for current availability on this La Palma La Gomera crossing between Santa Cruz de La Palma and San Sebastian de la Gomera. The small, circular island of La Gomera nestles between Tenerife, El Hierro and La Palma in the Spanish Canary Islands. 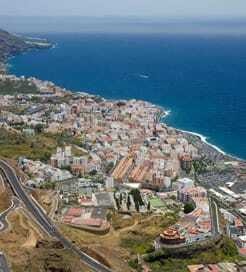 Characteristic of all the Canaries, La Gomera is volcanic in origin, defined by steep mountains and deep ravines. As you would expect, then, the island has some truly excellent viewpoints and an enormous network of hiking trails, all overlooking the UNESCO World Heritage listed Garajonay National Park and laurel rainforests. La Gomera is also noted as Christopher Columbus’ last port of call before discovering America. Consequently, there are some intriguing monuments and buildings where, according to folklore, he prayed and lived. As a tightknit group of islands, travelling by ferry is a convenient way of getting around the Canaries. 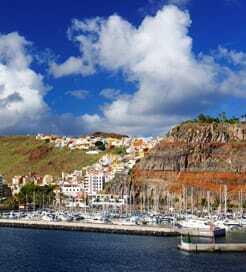 In terms of reaching La Gomera, it has the popular holiday spot of Tenerife immediately to the east and La Palma to the northwest, so it’s within easy reach from these islands, with ferries docking in San Sebastian.